In 2015 some companies in Sweden started trialing a six-hour work day for their employees to see if the reduction in hours had any impact on the amount and quality of work completed by the staff. We take a look at the potential positives and pitfalls of such a change and whether this could work in the UK. International newspapers, forums and work bloggers alike have bent themselves over Sweden’s experimental six-hour work day. However, people should by no means assume that this is anything like the norm in Sweden, says Maddy Savage, a UK expat living in Sweden. ‘Because the idea that there’s been a mass shift towards shorter days in my adopted home simply isn’t true.’ Savage explains that out of all her Stockholm contacts, she doesn’t know anyone with compressed working hours. However, there are several businesses that have made the move (some of them a long time ago). There were several experiments with the six-hour day in the 1990s in Sweden in care centres for children, older people and those with disabilities. However, when power passed from left to right in 2005, the trial came to an end. Although researchers claim that it was a good investment in improved well-being for the community (more people in jobs, better health and better working conditions), measuring the cost of these schemes is complicated. It’s hard to find out whether people take less sick leave and less unemployment benefits because of the shorter working hours, or because of other reasons. Linus Feldt (Filimundus, Stockholm-based app developer) told The Guardian that the eight-hour working week is not as effective as most people think. To get through the day, people start taking little breaks, like going onto social media, or checking articles on the Internet. To make sure the six-hour working day at Fillimundus is effective, employees are not allowed on social media and meetings are kept to a minimum. Feldt argues that this results in more motivated staff with more energy to get things done in a shorter period of time. On top of that, there are less staff conflicts because people are happier and better rested. 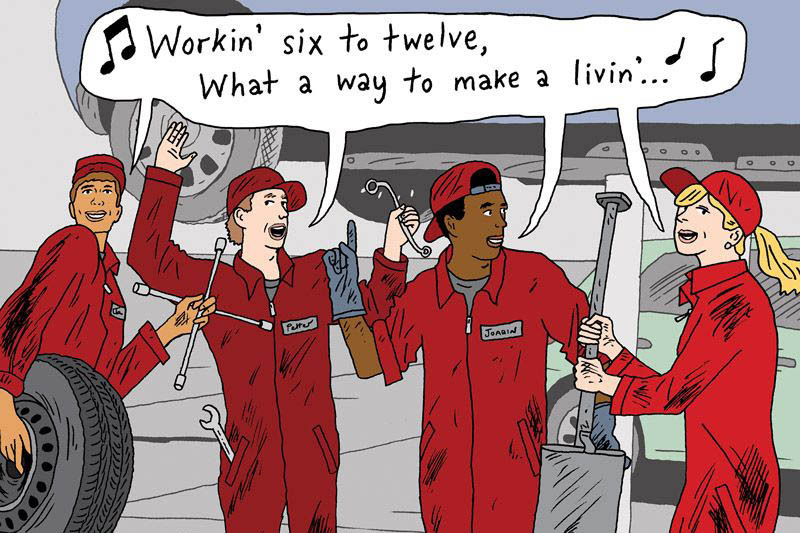 At Toyota’s service centre on the country’s west coast, shifts for mechanics were cut 13 years ago. 36 mechanics are involved in a scheme that allows them to work either from 6am till noon, or from noon till 6pm, instead of working from 7am to 4pm. Martin Banck, MD at the Toyota service centre in Gothenberg, even reports that profits have risen by 25% since the introduction of a six-hour work week. Staff feel better, there is lower turnover and it is easier to recruit new people (because the six-hour working day is attractive to job seekers). Staff also have shorter travel time to work, because they don’t need to travel in the rush hour. On top of that, there is more efficient use of the machines, so lower capital costs. Especially in offices, workers have benefited greatly from improved technologies like computers, scanners, automation, Internet, etc. One is therefore inclined to think that all this extra technology will make it possible for office workers to get the same job done in a shorter amount of time. But does it actually work to be in the office for only six-hours a day? Canadian born Ameek, who has worked both in the UK and in Sweden, can compare the six-hour day to the eight-hour day. He points out to BBC that the six-hour day might at times feel frustrating for people who are used to the ‘normal’ working week. If people are used to making phone calls out of standard office hours, they might feel as if they don’t get their tasks finished when they’re not able to reach someone at even 4.30pm. However, Ameek is sure that ‘the six-hour work day brings more benefits than drawbacks’, looking at it from a life-style perspective. The Independent concludes that we have to wait until the end of 2016 to know whether the cost of hiring new staff members to cover the empty hours is worth the benefits of the trial in the retirement home in Gothenburg. 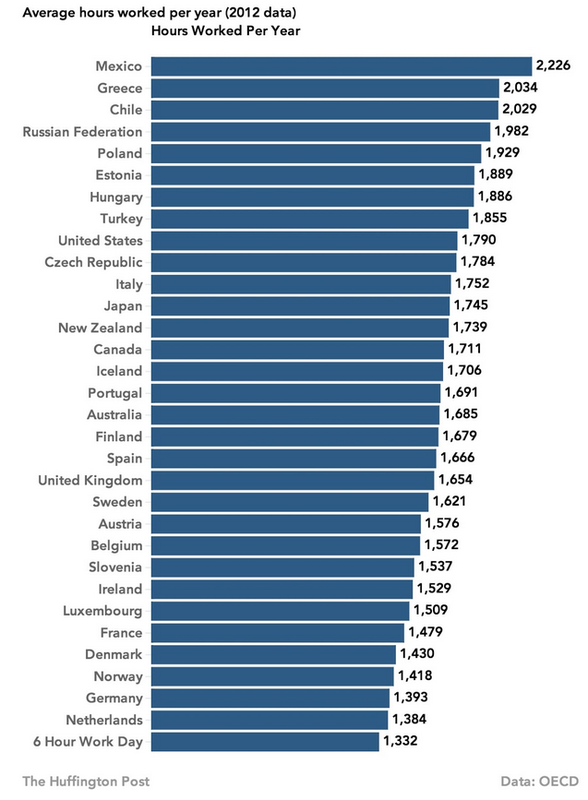 The US seems most enthusiastic about the six-hour work day. Perhaps this is because Americans have the longest working days and they are in desperate need of a better work-life balance! (average of 1790 hours a year, as opposed to 1654 in the UK). American websites stress that long working hours are related to health problems such as an increased risk of having a stroke, coronary heart disease, and mental health problems. This ties in with the change of attitude towards work that is embedded in implementing a six-hour work day. It’s not only about getting healthier or having more free time, it is about valuing quality of life over higher wages, a bigger house, or a bigger car. In short, ideally, it is working towards a less consumption-driven economy. People in other countries, like the Netherlands and Germany, don’t feel the need to shorten working days. The reason for this is probably that they already have a good work-life balance. 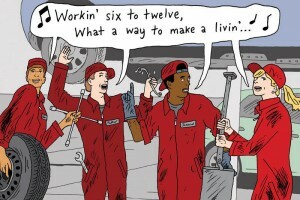 Their total annual working ours are close to the six-hour work day average anyway. (See chart). One Dutch researcher even thinks people will get stressed because they need to get the same tasks done in a shorter amount of time! We’ll probably have to wait and see how Sweden’s trials are working out before any changes in working hours will be considered in Sweden and abroad. Until then, working part-time might be an option, for those who are able to afford it. The eight-hour work day that we know in the UK finds its origins in the Industrial Revolution and the Labour Movement in the 19th century. A lot has changed since then, so who knows, our eight-hour day might be up for a re-think. We should not forget that it was an Englishman, Thomas More, who was dreaming of a six-hour work day as early as the 15th century: his Utopians ‘rise early and work for six hours a day.’ Whether we would spend our spare time wisely, that’s a question for another time!